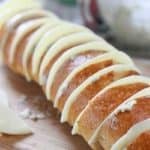 Easy Cheesy Stuffed French Bread! Made with store bought french bread and pre sliced cheese. This comes together in a snap! Combine softened butter, garlic, basil, and salt until well combined. Slice bread almost all the way through, leaving each slice slightly intact. Spread both sides of bread with butter mixture. (depending on the size of your bread you may have butter left over). Stuff a half slice of Provolone into each slice. Slather a tablespoon or two more butter on top of bread. Wrap up in foil halfway, leaving top exposed. Bake for about 20 minutes or until cheese in center of bread is melted through.